Chloe Gilliand (Sims) is a former Australian National Team Member and dual Commonwealth Champion for Women’s Artistic Gymnastics. 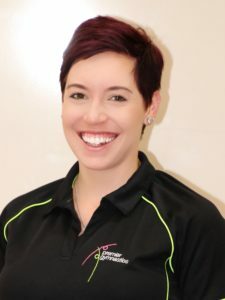 Chloe trained from an early age at Moreton Bay College and the Women’s High Performance Centre till her retirement from Elite Gymnastics in 2006. Chloe finished first all-around at the 2005 Australian Junior Championships, and first all-around at the 2006 Commonwealth Games in Melbourne. She was a member of Australia’s 2007 World Championships Team who qualified for the 2008 Olympic Games. After her retirement Chloe focused her attention on coaching. Chloe loves any opportunity to advance her knowledge in the sport she loves and currently holds an FIG 2 Women’s Coaching Accreditation and is an Advanced Women’s Judge. Chloe has been coaching since 2008 in many different classes from Kindergym to Seniors to competitive National Levels. She loves being able to pass on her extensive knowledge and passion for gymnastics to gymnasts, coaches and parents. Chloe say’s “the best part about her job is being able to watch girls who work hard and achieve new goals, skills or results which they have been working hard for”. Chloe hopes she can bring to the sport her experience as a gymnast with her technical knowledge, to her understanding of all aspects of training and competition. She wishes to continue to learn from great coaches within the gymnastics world to become a coach who inspires others.